The new exhibition by Kasa Gallery, It Sounds Like Art, is a collection of sound artworks that explore a variety of environmental, social, aesthetic and conceptual approaches to art. 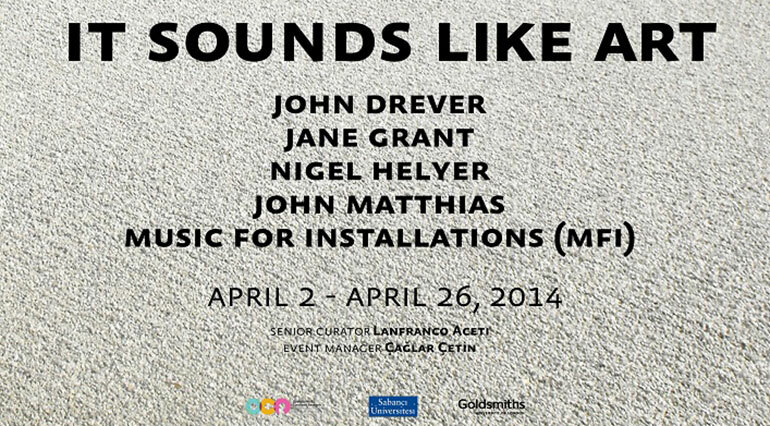 The artworks by John Drever, the duo Jane Grant and John Matthias, Music for Installations (MFI) and Nigel Helyer will provide an insight into sound art practices. The exhibition at Kasa Gallery in Istanbul precedes the Sound Art Curating conference in London organized by Kasa Gallery in collaboration with OCR, the Courtauld Institute of Art, Goldsmiths, New York University, the LARM Archive and Aalborg University. "The content [Inhalt] of a picture is not simply what it portrays but rather all the elements of color, structures, and relations it contains; the content of music is, for instance, as Schoenberg put it, the history of a theme" (Adorno, Aesthetic Theory, 1999: 356). Sound artists have developed new ways to express thematic content through original aesthetic canons and modalities of interaction that are increasingly diverging from traditional interpretations and are adopting strategies of representation and engagement that continue to redefine the role of sound as an art medium. It is the content, “as history of a theme,” that is offering the opportunity to sound artists to design and establish sound specific aesthetic practices able to provide experiences, recollections and perceptions of emotions, memories and visions. No longer encapsulated in strict traditional canons and definitions of materiality vs. immateriality, or sound vs. image, contemporary sound artworks exist according to their own ‘material / immaterial’ cognitive experiences, thematic contexts and aesthetic structures. Exhibition Dates: April 2 - April 26, 2014. Operating at the intersection of sound arts, soundscape studies and acoustics, Drever’s work represents an ongoing inquiry into the affect, perception, design and practice of everyday environmental sound and human utterance. Projects are often derived from extensive fieldwork. Drever is a Senior Lecturer in Composition at Goldsmiths, University of London, where he leads the Unit for Sound Practice Research. He is also a Visiting Research Fellow at Seian University of Art and Design, Japan. Sublime-sound‐of‐the‐one‐hand [Ryōan-ji] continues Drever’s exploration into ochlophonics – the notion of the crowded soundscape and the feeling of being crowded by the soundscape. On this occasion the location is the 15th Century dry Zen‐garden Ryōan‐ji in Kyoto, recorded during the cherry blossom season in 2011. Comprised of fifteen stones, although fourteen are only visible from any one point of view, Ryōan‐ji is a UNESCO World Heritage Site and has provoked response from many artists including John Cage and David Hockney. Jane Grant is an artist and academic. Her collaborative work has resulted in award winning projects including, The Fragmented Orchestra with John Matthias and Nick Ryan which was winner of the PRSF New Music Award, 2008 and received an Honorary Mention at Prix Ars Electronica 2009. The Fragmented Orchestra was exhibited at FACT and 23 sites across the UK. Her recent work includes Soft Moon and Leaving Earth; both films draw upon astrophysics and science fiction. Her sonic artwork Ghost was premiered at ISEA Istanbul 2011. In this work the temporal, topological networks and pathways of the cortex are explored in conjunction brain hallucination or ‘sonic ghosts.’ Plasticity, a collaborative work with John Matthias, Kin and Nick Ryan was recently exhibited at the BFI as part of the onedotzero festival, Google Campus London and HWK, Institute for Advanced Study in Germany. Jane is currently working on Heliosphere, a large-scale project about the ionosphere as the interface between the Earth and the Sun, a multi-screen film, Other Worlds about the interaction of the atmosphere of the Earth and its influence in looking into space. Jane, alongside John Matthias was commissioned by the River Tamar Project to create Fathom a huge sonic art work that created a sonic surface 6ft above the floor. On entering the building, visitors were immersed in an underwater sound-environment where the minute fluctuations of the sea are heard as they moved around the space. These fluctuations were marked by waves of live and recorded sound moving across the building triggered by environmental events, the tides in confluence with the Tamar Estuary. With John Matthias, Jane co-directs the NeuroArts, an international series of symposia that brings together artists, scientists and philosophers. NeuroArts is an interdisciplinary exploration and interrogation of the field, an exchange of ideas between artists, writers, experimenters and theoreticians. Jane writes about noise, science and art and the mutability of matter. She is Associate Professor (Reader) in Digital Arts at Plymouth University, co-director of the research group art and sound and Principle Supervisor in the Planetary Collegium, CaiiA-Node. Dr. Nigel Helyer (a.k.a. DrSonique) is an independent sound-artist who has forged an international reputation for large scale sound-sculpture installations, environmental public artworks, museum inter-actives and new media projects. Nigel is a longstanding collaborator at the SymbioticA lab UWA, realising such projects as GeneMusiK a biological music remixing system, the insect installation Host and as the Artistic Director of the infamous LifeBoat project shown in Oslo Fjord 2004, on a Baltic cruise ship during ISEA 2004 and in Zagreb 2006. He has also worked as a sound-artist/researcher at the Paul Scherrer Institut, Switzerland with the Tropical Marine Research Labs at the National University of Singapore. Nigel has held visiting Professor positions at the School of the Art Institute of Chicago, Stanford University, La Esmeralda, Mexico City the department of Architectural Acoustics University of Sydney and the School of Computer Science and Engineering at UNSW. He developed a powerful virtual audio reality mapping system, Sonic Landscapes with LakeTechnology (now Dolby Australia) and was the Artistic Director of the AudioNomad Research Group developing the AudioNomad location sensitive environmental audio system at the School of Computer Science and Engineering UNSW (funded under a ARC Synapse grant). Subsequent developments in acoustic cartography have been realised as a series of national and international exhibitions Syren, aboard the MV Opera in the Baltic Sea (ISEA2004), Syren for Port Jackson (MCA Sydney 2006), Run Silent Run Deep (National Museum of Singapore ISEA2008), Ecolocated (Belfast ISEA2009 + FACT in the AND Festival Liverpool 2009) and the GhosTrain Project (ABC + The Performance Space 2009/2010). The EcoLocated project concerned the sonification of water quality data, a method which is currently being developed in a series of environmental audio-portraits; the recent VoxAura; the River is Singing commissioned for Turku, European Capital of Culture 2011; the Deluge current project located in the Black Sea; Upstream/DownStream an ARC funded project at the BundanonTrust 2013/17 and as part of the current Under the Icecap collaboration with Dr Mary-Anne Lea of the University of Tasmania and the Institute of Marine and Antarctic Studies investigating the sonic potentials of bio-logging data in the Southern Oceans. Music for Installations (www.musicforinstallations.com) involves the search for the experience behind the sound. By using drones and soundscapes, the focus is primarily on the experience of the emotions and reactions that these provoke. A dark rectangular space where soundscapes and drones are unleashed force the listener to become part of this unique experience. We can expect an intense manipulation of various existing and proprietary sounds to create new imaginary music. The result will invoke emotions, whether they will be positive or negative. Creating ambient music, soundscapes and drones, electronical music was always a passion. A residency in Arteles made it clear that music and sound was the way to follow. Next to ambient releases under the alias Lounasan, Music for Installations worked hard on the Dark Side project. This is a musical translation of the state of a depression. By using dark ambient as language, this is one of the first attemps to transfer the chaos that goes along a depression into an emotional story. It’s to the listener now to respond on it. John Matthias is a musician, composer and physicist. In 2008, he won the UK PRS Foundation New Music Award (The 'Turner Prize' for music) with Jane Grant and Nick Ryan for the development of a huge sonic installation entitled The Fragmented Orchestra which won an honorary mention at the Prix Ars Electronica 2009. He has released four albums; ‘Smalltown, Shining’ (2001), ‘Stories from the Watercooler’ (2008), ‘Cortical Songs’ (2009) (with Nick Ryan), which includes remixes by Thom Yorke, Simon Tong and Jem Finer and ‘Geisterfahrer’ (2014). ‘Cortical Songs’ was voted one of the top ten classical albums of 2009 by Time Out (Chicago). John has also won awards at the Cannes Film Festival and the Prix Italia. He has collaborated with many recording artists including Radiohead and Coldcut and has performed extensively internationally including at the Ecstatic Music Festival in New York, The Pompidou Centre in Paris and at the Royal Opera House in London. He has recently been involved in collaborations with the Rambert Dance company in London and artist, Stanley Donwood in San Francisco. He is Associate Professor in Sonic Arts at Plymouth University, has a Ph.d in Physics from Exeter University and is Co-Director of the Art and Sound Research Group at Plymouth University.